So I was looking through the RP topics, reading my old RP's that I've been in and what characters had participated and whatnot. I have to say, doing it makes me a bit sad. I was in some amazing RP's and then they just up and stopped so abruptly. It's like their story never reached their end and the characters are frozen in time (being literal and sarcastic at the same but bear with me here lol). I have to say that I really miss the days when I could log on and RP for hours with someone else or even just a small group of people. A time where action, romance and mystery lurked around every corner. Places like Croaria on OtakuWorld, Myrr and Aura Wake on this place. I miss those RP's so much and I'm sad to see them unfinished. But the sad truth of all of this is: we all grew up and apart. *raises my hand* I may not be the best Rper ever, or best with keeping my own ideas going but I am almost always online and willing to RP. If anything I've been getting more and more lonely with no one on any sites to chat with even ^^; I also just want to get all the time possible RPing since i have to leave in a few months... so I would be willing to try anything to get more Rping and having fun with people in. Not sure if you've been browsing through the massive Discontinued or Finished RP section or not, but this lack of activity thing is actually typical Geneforce. Despite that, myself and some of the other mods are frequently working on a personal project that desperately needed our attention. It's a massive WIP (work in progress) so I'm incredibly happy we have this site to use as our workspace. This project is taking up most of our attention from the other RPs going on at this time, but Luna also really loves the Pokemon RP and she's constantly developing new ideas for it. However, I would certainly be interested in seeing/playing more RPs and stories going on that don't have to do with this project. I asked NewGen as a whole many times about "What you would like to see here?" and I only got a response from Dyl. Nobody else seemed to offer their input. I'd also like to point out that Luna and I have been consistently trying to put RPs out there for you anyone to join. I have the Lost Boys: Renegade of the Mind going that has only one response from Luna. 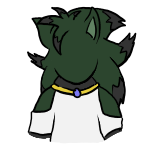 She also has the Tales of Iciaura: Search for the Story Fragments, which may be on a world she created and is unfamiliar to you, but just talk to her about it and it'll be just fine. I believe Enigma was also running that Treasure Hunters: Search for the Cloak of the Divine ones? Do any of these just not interest you? What would interest you/be a good plot/story to tell that is multiplayer (aka not one on one)? I don't honestly mean to sound so straightforward or brutal, but I'm genuinely interested in what you guys would actually want to play. Here, I'll offer my own input/personal preference when it comes to RPs now: I like fantasy and sci-fi RPs. Slice of Life is rather boring for my taste. I hate RPs that mindlessly kill off characters, involve pretentious and overpowered protagonists/villains and I like knowing what I'm getting into before hand so I can make good/interesting decisions (quest-based, if you will). I also like a plots that are reasonable and within the bounds of the universe that which the story/setting takes place (no stupid angels/demons whatever in a universe about super smart spaceship-flying astro-monkeys - that just doesn't make sense). I also really like furries/anthros, robots and fantastical creatures that aren't just your average orc or elf. Well, one thing that I'm wanting to know is why is it just one day? Anyways, I do miss those days too, and I'd be somewhat open to that (except since I'm a student then I would have a huge amount of days unavailable.) but I think that over time is better. After all... the main reason that I got interested in CoC was the plot. In one day you can't really get as far as we did there. that being said... due to a hiatus from RPing, I feel like my skills have degraded significantly. I agree with Dyl. A good RP takes time, effort and players who want to keep it going. If time is what you need, then I am certainly willing to help modify this rule to extend the time it takes for an RP to expire. I trust that 60 days (2 months) is enough time? ShadowFantasy, I'd also be willing to restore one of your RPs that have expired, on the condition that it must be multiplayer (not one-on-one). Which one shall I prevent from being placed in the Discontinued section? If you really want to restore an RP from the discontinued section I'd really like to bring Croaria back and give it its own 'reboot' so to speak from when it was at its high time in popularity on OW. It was a hell of an RP with action/adventure, romance, some drama and even sci-fi. I'd love to bring it back but its such an intensive RP that a lot of people get bored really quickly. Most who enjoy its great story elements stick around up until the very end and the NPC's always catch at least one person's interest at some point. Really for me in terms of RPing I love my medieval times plots, action/adventure plots and fantasy/sci-fi. It's so much fun for me to send my characters into battle and watch them fight to the best of their abilities. I did have an RP idea that could involve the whole site but I don't know if anyone'd really be interested. Alright, I'll go ahead and grab the initial post of that one and restart the RP for you, but feel free to edit that same post/continue the post if as much as you'd like. I think its a great idea to reinvent it because then you'll have a chance to take your older ideas and refresh them to make them feel shiny and new! Regardless, if you guys ever feel like there's not enough of your favorite kind of RP around here, make one! It's really easy (most of the time)! Omg Zazul had some of the best RP's too. I was in two or three of them so I definitely know what you mean Rocky. If you guys want, I had a sort of site wide action, fantasy and magic styled RP that involves a lot of fighting and heroics. The idea was that each player gets to play one of their most used or most comfortable characters to use and I give them a choice of a relic at the start. They use that with their magic to summon a guardian spirit (each one would be different depending on the catalyst you picked at the start!) to help them fight in a big battle royale for the prize: one wish of their own deepest desires. The guardian spirit would be one of my more famous characters based on the class of guardian that's summoned (Beserker, Mage, Healer, Knight, etc.) and each player would be allowed to give them orders when fighting. It's still kind of a work in progress but it's an idea I'd love to do! I know Mobi well though >.> so if he makes a Rp then I don't hesitate to try and join into the RP. Though I have always had problems joining RPs if I wasn't invited in ^^; Probably cause I know some people who get very... controlling of how the stories and such go so I've always been nervous about that. I shall try to join more Rps though and be not just the stalker in the corner that only talks to Mobi. Luna and I have tried to find a way to publish a section on the site dedicated to the hottest (aka, most popular and active) RPs, but that so far has been ineffective. We might have to search and play around a little more, but we just don't want to break anything. We can always just shut the site down for the day and play around with the format/everything but I'll have to talk to the others about that first. However, you guys see that scrolling text banner across the top of the website? Then it occasionally links to whatever contest is going on right now (Multiverse, currently)? We can always do one of those for the hot RPs. Like I said, if you got an idea, don't be shy to put it out there! We'd love to see the content you'd create. Also, some tips before you publish your new threads: you can always create a poll to make sure there is general interest in your idea and perhaps get your character/story ideas out there. I can always create a Brainstorm section for this kind of thing. Would that help any? I think the brainstorming and the poll thing is a great idea Rocky. Back on OW we had a big organization system too for every RP that made it easy to sort through like character pages and the actual story or RP. Why not stuff like that? "Oh on this site, we did this"
"We should do this like this site does"
"I liked that site cuz they did this. We should do that." It's great to have ideas, and use similar ideas to other places, but do not compare us. o-o Whoa chill out man. I hate to say that I do that a lot too but that was one of my best RPing places back then. It's hard to find ones with a good community you know? I get that it's 'one of your best'. I don't really have room to talk for this part, but it isn't fair to others who have been with this site longer then you or me. Maybe they don't like seeing themselves compared to the standards that you're used to. And, no. I don't know what its like finding a community that's good. I have yet to find one, which is why I'm here. I have wierd tastes in Roleplays, and people I meet on forums. Each one I've been on has treated me the exact same way; like total crap. Maybe this place will be different, or maybe not. Only time will tell me that. While I don't exactly appreciate being compared to others, doesn't mean that we can't steal use ideas from them. Perhaps we just don't mention names? That way it doesn't feel like advertisement? Also, 'Treasure Hunters' has been moved back into the RP section. I can agree to that. But like, if we want to throw ideas around for making the site more manageable or even just more fun to roleplay on, I'm sure Rocky, Luna and Phirainia are open to suggestions! Dude, take a look in the general discussons thread. tell me what you see. 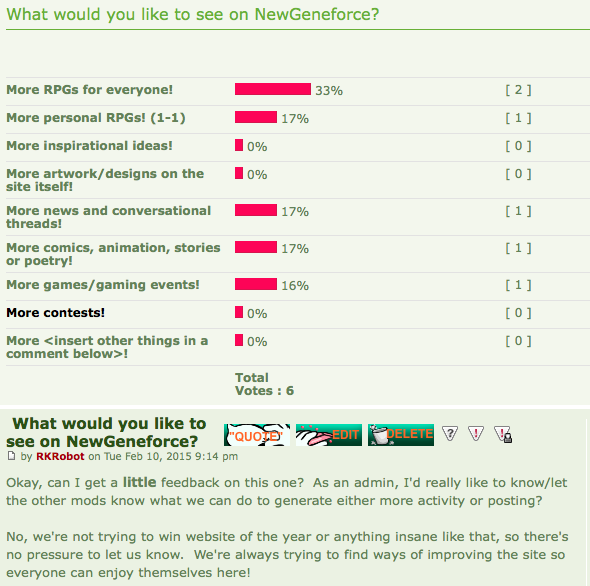 A: Polls and threads about suggestions and what we wanna see/do on geneforce? WE'VE BEEN TRYING TO GET SUGGESTIONS AND IDEAS OUT YOU ALL SINCE YOU JOINED. DYL HAS BEEN THE ONLY ONE TO RESPOND TO ANY OF THE THREADS. Are we going to start using reaction gifs in our posts now? Is that the new trend? Because if so, then I strongly encourage it! But yeah, we've been asking for suggestions for a while, but don't really hear anything back? Because of that, we won't know if you guys want to try anything different on the site. Don't be afraid to come ask us about something new in a new thread or a PM -- we can work things out with you guys, alright? Please, I really mean it! We want to make this site better for everyone, but we need your input to do that! I personally mean no offense here, like seriously i really don't. Stop saying you're too shy to do something. If you're too shy to join even a Forum game, then why exactly are you here? You guys want a 'good community' but you're too shy to approach and actually see if it IS good or not. Open up. Join a damn RP that isn't 1v1. Play some games with us. Post some goddamned artwork. At least TRY and break this 'shy shell' you have instead of sitting in a corner. I get that people are shy, and it can be hard to open up. Believe me, I know. But if you're gonna join this site, then just sit in a corner with one other person and just input one thing like a computer, then maybe an RP Forums full of Extroverts isn't right for you. We asked you guys twice. I remember I deleted a third topic in this same section that was from 2011, but only because those problems were solved (changing the background, making banners, changing layout, etc.). I will not make a new suggestions thread. I know text can be misinterpreted as hostile/blunt sometimes, but try not to be too intimidated by this. Behind every computer screen there is another living, breathing human being. We don't tone check or ask you to restate your question because you sound demanding or whatever. If you make a suggestion, call it a suggestion. We don't do requests (I absolutely hate those with all of my being) and we're not magic admin fairies with the power to do everything. Our host site (Forumotion) is pretty limited in actuality and none of us are proficient in CSS or HTML coding. "Do you think you guys could ____?" "Have you tried adding ____ to your site?" "Could I make a suggestion? ____?" "Would you be willing to change ____? It affects me because ____?" "If you could do ____ for me, I'd appreciate it." Stuff like that. If you aren't sure we have a certain feature, and you ask a question about that feature, we will let you know if we have that desired feature or not (or if its possible to do). If you don't know how to do something on the forums, check out the FAQ first (yes, we have one of those) and if that doesn't help you, PM me, Phi, Genesis, or Luna. I've been really busy and stressed out this past week. If I sound/seem ornery, I don't mean to be, but please excuse that for now. Also Rocky, on the subject of RP's, are you having trouble replying to Primal Instinct still? Like if it's anything in particular just let me know and we can talk about it to get the RP going again.